It’s been just over a year since I upgraded my home desk setup to be principally a standing desk. At first, I simply put the existing desk up on cinder blocks, but since moving last November, my home setup has lost a little weight. It’s not more humble, no longer consisting of three desks to support a full-time work-from-home design studio, but in any case, I’m still standing. In the past year I’ve come to discover some good points and some bad points about standing desks. Most of these observations, I think, are pretty universal, though I admit to having some particular quirks in this matter. I am, in general, very finicky about my desk and computer setup. I notice the little things. I should also note that I am only using a standing desk at home. At the office, and indeed the three previous offices I’ve worked in this year (ugh, don’t ask), I’ve been made to sit and work in a conventional, sometimes brutally uncomfortable setup. Here now is a review of my first year with a standing desk. Mobility. I love being able to step right up to my desk. This makes it exceptionally good for quick tasks like syncing your iPod or looking up directions, which you can practically do one-handed while walking to the other room. Not having to sit down and get settled, or even to bend over and awkwardly operate the computer, is great. Morning Routine. Like many designers and computer geeks, the computer is part of my morning routine. Before I even make my way to the bathroom to brush my teeth, I download my email, check for new podcasts, and fire up my feed reader. It could be argued in the larger sense whether this is a bad habit, but the fact that I’m standing helps wake me up. It allows me to shake out my feet and knees and stretch out my back. It means that while waking up, I’m not tempted to slouch or even slip back into sleep in the comfort of a desk chair. It’s also great for walking back and forth to the kitchen to, say, make a cup of coffee or bowl of oatmeal. Mornings are better standing. Gaming. Since building a Hackintosh last August, I’ve had a few occasions to get lost in a game, even while running Windows. Simply put, gaming while standing is great. I forget that I’m standing and can become just as emerged in the game as if I were slumped on a living room sofa. I can use more of my arm to operate the mouse and keep at it for hours. Busybody workflow. One nice thing about a standing desk is not having to move from standing to sitting and back fifty times a day. If I’m printing something out, and then need the stapler, and then the phone rings, and then I go for a glass of water, etc. etc. I can do it all in the same position without having to transition down and up. I think we’ve all been there when we settle back down only to realise our pen is left over by the coffee. Up again. Space-saving. I live in a studio apartment in Manhattan. To say space is at a premium is an understatement. And while a chair doesn’t take up a huge amount of space compared to, say, a bed, I’m literally trying to save every inch I can. Having a standing desk saves square footage by not having to clear an area for the chair to maneuver. In my case, I can also push the desk closer to the wall since leg room is not a concern. As a quick tour of Pinterest will reveal, some folks are using standing desks that are scarcely deeper than a laptop, allowing standing desks to be tucked into closets and the like. It may not be a principal advantage of standing, but it’s a nice bonus for home or office. My feet hurt. Most users of standing desks will confirm that it takes a few weeks to get used to being on their feet, but my feet still hurt. My feet always hurt. I have flat feet, and I roll in and grip with my big toes. Between dancing and running, I’m constantly putting my feet under stressful conditions and I generally beat them up. My cat also likes to nibble my feet, but that’s relatively minor. However, part of the problem is that at home I prefer to be in socks, flip-flops, or barefoot, reducing the potential cushioning on my feet. And although I equipped my setup with a yoga mat shoved under the carpet, don’t have a purpose-built anti-fatigue mat as one might do at a workplace. If I were presumed to be wearing sneakers and using a thicker, softer mat, my feet might hurt less, but as it stands now they still hurt, especially for extended periods of standing. I sometimes get jelly-legs after a whole day standing, but it’s usually my feet rather than knees, back, or thighs, that bare the brunt of standing. Tough for extended periods. I tend to fidget and adjust my position very frequently, probably once a minute or so. In some ways, that’s good that standing allows me to do so, but it also means that working for several hours can be a tough undertaking. I find it extremely daunting to face 6+ hours of working at a desk, as one might have to do in an office. Even with taking purposeful breaks throughout the working day, standing is a lot harder when it comes down to cracking into some purposeful work. Part of this could be that, as I have said, I’m not using it at the office, but at home. The mentality of working from home (on weekends and on side projects) is that I’m supposed to be cutting my time short. I don’t want to get in the habit of spending an entire Sunday in front of my desk, but with the standing setup, it seems that is not even an option. I’d at least like for it to be an option. Bad to watching movies/TV. Ok, this is probably a first-world luxury thing, but I used to watch a lot of videos whilst seated at my desks. The amount of work I was simultaneously doing varied a great deal, but since the standing desk has taken over, it’s almost impossible for me to do work and take in entertainment at the same time. I find that I can’t concentrate on the movie and also find the energy to stand. Sadly, I have caught myself leaning over onto my elbows watching the laptop screen, supporting my weight, and simultaneously hurting my back. This silly position is entirely against the point of a standing desk. No option to sit. In my present setup, I do have a stool, but it’s actually too low for me to sit and work properly. I look like a child seated at his father’s desk, stretching to reach the keyboard and looking upward at the monitor. This is just a function of my own height; in order to feel comfortable while standing, I have to be uncomfortable while sitting. An adjustable stool, like one seen in traditional studios, might go a long way to sorting this out. I haven’t become miraculously more healthy. I can’t say this is a drawback, exactly, but there is a great deal written about the health benefits of standing vs. sitting. In my case — and again, I’m only using it at home — I haven’t been transformed. I haven’t lost lots of weight or vanquished any enduring illness. My back isn’t magically healed and I don’t feel particularly more energetic. I’m an active guy as is, usually taking on about 7 or 8 workouts a week of various kinds. I get my 10,000 steps most days (usually well over it), but standing at a desk for continued hours barely adds to this figure at all. I won’t go so far as to say sitting is healthier, but in my limited use, I’ve seen no change to remark on. Two-tiered desk. I clearly don’t have the space for such a contraption, but imagine if I had a two-tiered desk (a part for sitting and a part for standing). If I felt like sitting, I could move the monitor to the seated part via an adjustable arm. A wireless keyboard and tablet/mouse might make this a lot easier. Or if someone else was using a laptop instead of a desktop, that’s practically a slam dunk. This solves the problem of not being able to sink in for a long day of work, even if it’s a weekend. Adjustable desk. There are more and more adjustable desks coming on to the market at all price ranges, and while most can boast the ability to be seating or standing desks, I’m actually talking about adjusting an inch or two when needed. My current desk is bolted to the wall, and although the legs are adjustable, there is no single control to easily raise or lower entire setup. Why do I need an extra inch here and there? Because sometimes I’m wearing shoes. Sometimes I want to stand more straight up, and other times I want to spread my legs and lower my height. I might want to use the above mentioned stool or maybe someone else wants to use my desk. All this would require some adjustment. In my opinion, this is ideal. You can have a standing desk 90% of the time, but when you absolutely need to sit, you can drop the height and get busy. In the next post, I’ll provide details on my setup and how I built it, including my cable management and lighting situation. A number of folks have asked me about it so I think it’s time to fork over the goods, including photos. 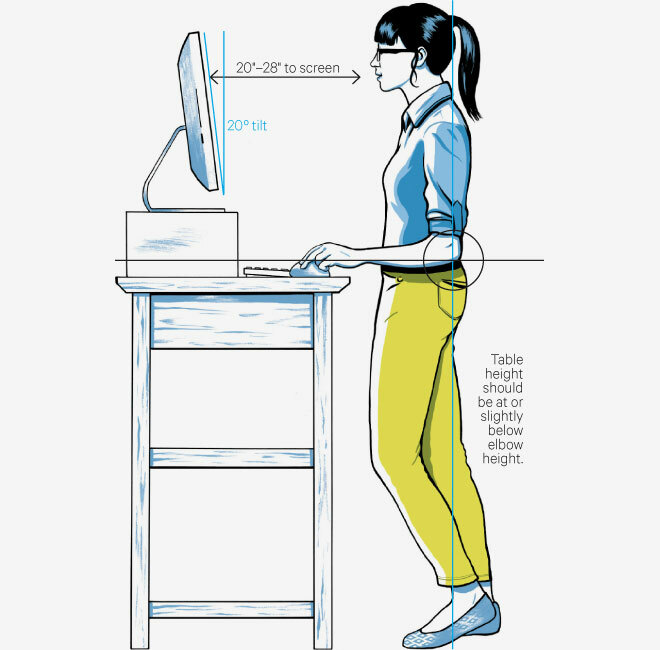 Have you switched to a standing desk? What have your found in your own field tests?